Add quick little pouches to your Christmas crocheting for all the people on your list who are receiving gift cards this year. 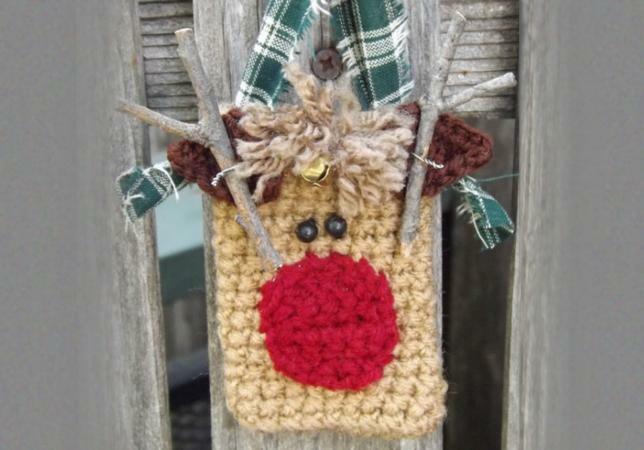 Young and young at heart will love this adorable reindeer card holder. Hang him on your tree to ensure the card doesn't get lost among other gifts, then display him as an ornament after the gift has been "unwrapped." This gift card holder can be completed in less than two hours. If making more than one, make several duplicates of the parts then put them together in assembly line fashion. Click on the image of the pattern below to download and print the Adobe file. Many crochet patterns will have additional materials other than yarn. 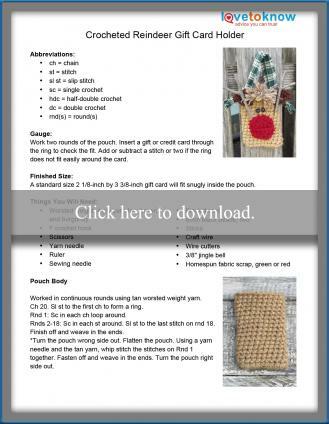 The following tips and ideas are alternatives to items you may not have on hand to complete the crochet reindeer gift card holder. A yarn needle is a basic tool for crochet projects, but if you do not have one, the bottom of the pouch can be slip stitched closed and the items that are stitched in place can be attached with craft glue. If your yard is covered in snow then hunting for sticks can be a challenge. Brown pipe cleaners are a wonderful alternative. The jingle bell is cute, but small holly leaves, buttons or red pom-poms will also offer a festive touch to your reindeer. The antlers are attached with craft wire, but stitching them in place with yarn will work just as effectively. Glue them in place if a yarn needle is not available. For more crocheted options, give one of these patterns a try. Each holder can successfully be accomplished by a beginner to crochet. Petals to Picot shares a cute gift card pattern with this jolly little Santa belly pouch. Changing colors while crocheting the pouch means there is minimal assembling to complete. If you need a card holder that can be used for a variety of gift-giving occasions, then the simple little pattern at One Artsy Mama is a great choice. For a more personal touch, whip them up in the recipient's favorite color. The little mitten holders at FaveCrafts would not only be a great way to present a gift card at Christmas, but they would be an ideal pouch for Valentine's Day or a winter birthday too. They could also serve as cute little favor bags for your child's school party. Crochet gift card holders are fantastic projects to use up ends and scraps of yarn left over from previous projects. If you know gift cards will be on your gift lists for any occasion, then crochet a few holders whenever you have a free moment to make gift-giving easy.